The Samsung Galaxy Mini is a recently launched Android phone which is a bit on the small side, but offers plenty of bang for the $229 that it costs right now unlocked. While being a budget phone means that plenty of features are left out or they’re not as good as they could be, the S5570 offers a good experience, especially if you’re a beginner with Android, that wants to test the waters before getting a more expensive model. Galaxy Mini’s OS is Android 2.2 Froyo and the processor installed on it is a 600MHz model, which isn’t much when you compare it with the 1GHz that most phones come with these days, but it does its job well enough for daily use. Holding the Mini in your hand feels good. The phone is thin, the materials used are good, it weighs 105 grams and its size is 110x60x12 mm, making it small and light enough to keep in your pocket and use with just one hand if needed. The screen size is a 3.14 inch, which is decent and sufficient for everyday use. The QVGA resolution is the weak point of the phone with just 240×320, which isn’t great for an Android phone and it’s the area where the cost cutting strategy did the most damage. While this resolution isn’t really enough to play a decent game of Angry Birds, it does take the price down and allows for the rest of the phone to come with plenty of nice features, considering the low price. The front of the phone has three buttons in its lower part, with the rest being occupied by the touch screen. The side panels have the microSD card and the power button on the right side and the volume buttons on the left. At the top you will notice the microUSB port and the 3.5 mm audio jack. As for the back, there is the compartment where the battery is housed and a 3.15MP camera. The coverings used for the microSD and micro USB slots look a bit fragile and they could take some damage if they’re not handled with care. 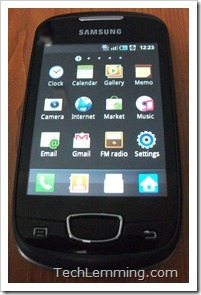 The OS of the phone is Android 2.2 Froyo, which is pretty good for a budget smartphone. Chances are that 2.3 Gingerbread will not be made available to this model, since the processing power would not offer a great experience. 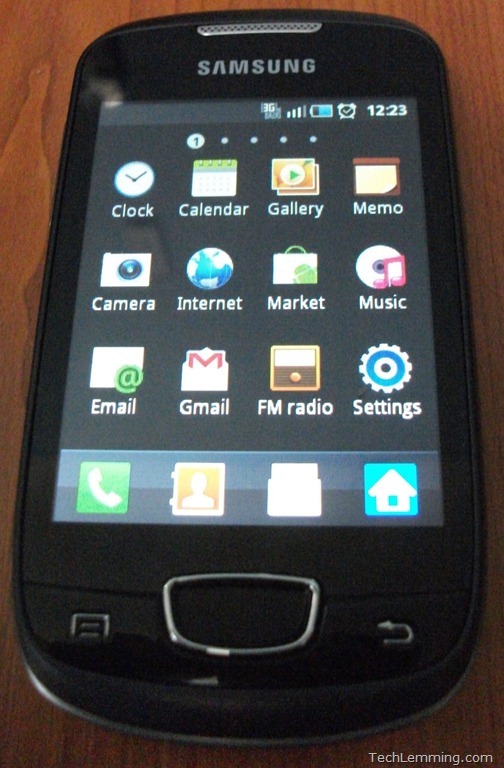 The UI on it is the TouchWiz 3.0, which allows for the user interface to be optimized for the small size. Thanks to the 600MHz processor and 384 MB of RAM the phone responds well enough. This is the area that makes this phone worth it and it’s where Samsung didn’t skimp as much. The Mini comes with all the basic connectivity solutions you might need: 3G HSDPA, EDGE, GPRS, Bluetooth 2.1 with A2DP (Advanced Audio Distribution Profile, which allows streaming high quality audio via Bluetooth, from one device to another, an example being streaming music from the phone to a wireless headset) and WiFi 802.11 b/g/n. Another nice feature is the GPS with support for A-GPS and for Google Maps. The battery which comes with it is a Li-Ion model at 1200 mAh, good enough to provide around 2-3 days of moderate use. The camera is a basic one, with 3.15MP and a resolution of 2048 x 1536. It lacks both autofocus and flash and the quality of the photos isn’t great. As for video, it can record at 15 fps and QVGA resolution (320×240), which is pretty weak. The Galaxy Mini comes with a standard media player and the phone can play MP3/eAAC+/WAV music files and H.263/H.264/MP4 video files (though watching movies on the small display isn’t the best experience, but it will do in a pinch). The music player also has an FM radio with RDS, which I didn’t test. The Samsung Galaxy Mini’s internal memory stands at 160MB, which is sufficient to store as many phone book entries as you want. The microSD card slot allows you to add up to 32GB of memory to the phone and it’s being sold with a 2GB card included. As with everything else, it’s true that you get what you pay for … usually. The Mini S5570 offers that little bit extra though, and it’s hard to get something much better for the $229 you pay for the unlocked Mini. If you’re looking for a quality entry level Android phone, this one would be a good choice. If you’re looking for an affordable Android smart phone, the Samsung Galaxy Mini deserves serious consideration. If you’re looking for connectivity, it offers plenty of features in this department. It makes sacrifices in the resolution and screen size, but it offers features in exchange. There aren’t many phones that can offer you as much as this one for the same price ( around $200) and the rating reflects that.